I personally am not a big breakfast eater, but it isn’t that I do not like breakfast foods. In fact, I love traditional breakfast foods, but I simply am not very hungry first thing in the morning. On weekends however, I like to plan one day where I prepare a special breakfast, or brunch to enjoy. Last weekend I was home alone on a Sunday and after going for my usual your power walk, I had swim in our pool, and by late morning I decided I needed to treat myself. 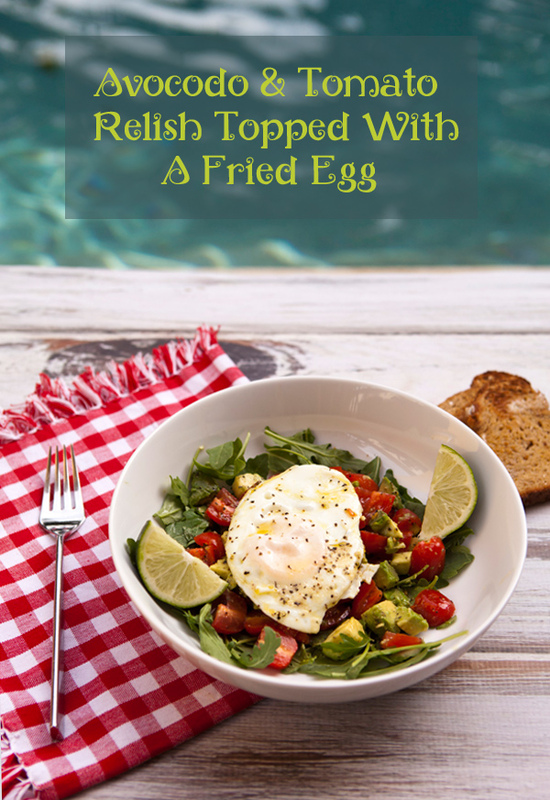 I pulled together this quick and easy dish using ripe avocados and tomatoes I had in my kitchen topped with a fried egg. 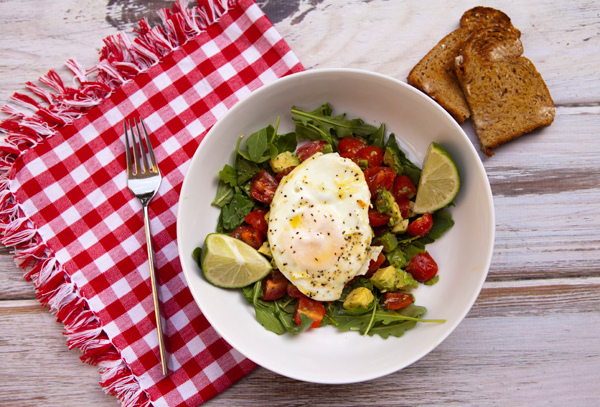 Served with a slice of whole grain toast, and brightened with some fresh lime juice, this easy breakfast dish was delicious, nutritious, and prepared in mere minutes. I have chickens at our home in Italy, and started frying my freshly laid eggs in olive oil when we were there. You need to use a good quality of oil, and continually spoon the oil over the egg as it cooks until the whites are just cooked. The yolk will then run over the other ingredients after you cut into it creating a delicious dish to sop up with whole grain toast. By adding a handfull of chickpeas, and perhaps some chopped Kalmata olives, this dish could also be lunch, or a light dinner entree. Avocados provide nearly 20 essential vitamins and minerals: potassium, folic acid and other B-vitamins, as well as vitamins E and K. They also contain phytonutrients, believed to help prevent many chronic diseases. Avocados contain the mono- and polyunsaturated “good” fats that are recommended as part of a healthy diet. Eggs are a great source of protein. Numerous vitamins, including vitamin A, potassium and many B vitamins like folic acid, choline and biotin, are also packed into this oval-shaped powerhouse. Lutein and zeaxanthin, two antioxidants found in egg yolks, help prevent macular degeneration, a leading cause of age-related blindness. Toss the avocados together with the tomatoes, lime juice, salt and pepper. Arrange the arugula leaves in a shallow bowl, then spoon the tomato mixture on top. In a small frying pan, heat the olive oil until lightly smoking, then cook the egg, spooning the oil over the top as it cooks. 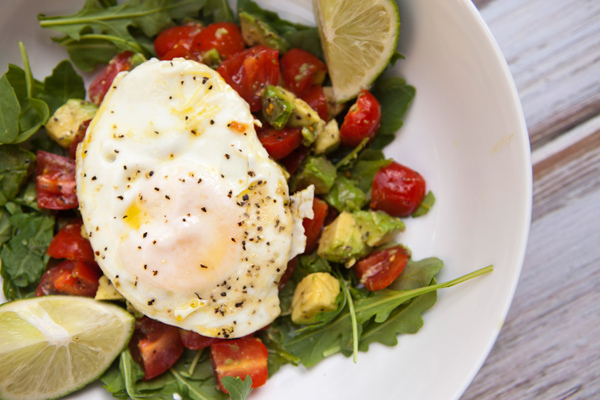 Once the whites are set, but the yolk is still soft, remove from the pan and place over the avocado and tomato mixture.